This landscape captures the brillant colors of Fall in all its glory. I especially love the contrast of the orange, yellow and red leaves with the river and waterfall. 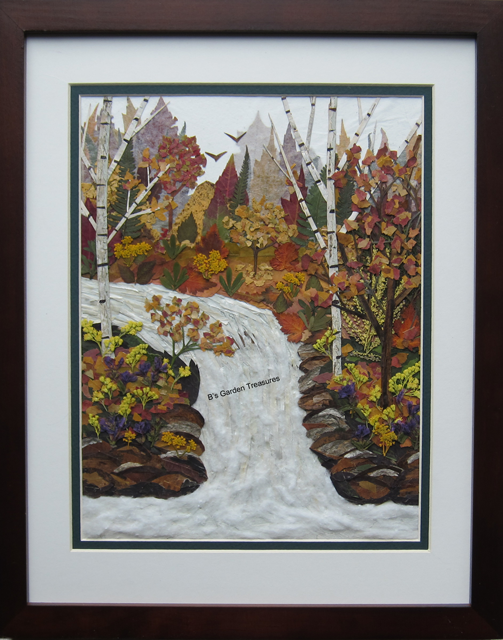 The birch trees are made with real birch bark. The foreground is decorated with goldenrod and purple loosetrife which are in bloom this time of year. Botanicals: Poplar, burning bush, smoke bush, asiatic lily, poplar, and miscellaneous Fall leaves; birch bark, banana skin, cotton, fern, garlic skin, purple loosestrife, goldenrod, and beehive. 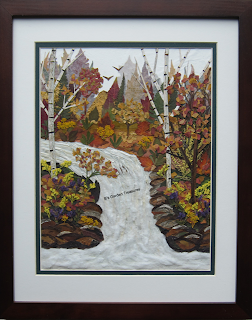 This 11" x 14" framed original was sold at the Hunt Country Vineyards Harvest Festival (Oct 2013).